Welcome to the Sheps Website!!! WHAT? NO SOUND?? CLICK HERE!!! Dedicated to our biggest fan... Charlsey!!! A Tribute to Sonny Til and the Orioles... "Crying In The Chapel"
CHECK US OUT AND SEE WHAT WE'RE ALL ABOUT!!! First of all...let us introduce ourselves to you!!! Just want you all to know that we really appreciate your signing our guestbook with your support and suggestions through the years! It makes us proud in our endeavor to keep r&b alive and well. During our career we have met some really great fans and personalities, may it be from concerts, weddings or bar mitzvahs. No matter what the particular vendor is at the time, we have always come across so many positive minded people that have so much love for the music. Rhythm & Blues, Rock 'n Roll or DOOWOP...whatever you may call it, we feel as time is going by it is getting stronger and stronger (again). It may not be at the top of the music genre as it was in the '50's or '60's, but such beautiful music which is yet so uncomplicated will always find a place in people's hearts. Again, we, the Sheps want to thank each and everyone of you for your love and support! Johnnie, Richie, Charlie, Tommie and Tommy. The song you are listening to right now is entitled "Crying In The Chapel" It was recorded by the group "The Orioles" way back in 1954 on the "Jubilee" label. We had the great pleasure in recording this song along with 17 other great selections on our new CD titled "They're Singing In The Sky!" This particular CD is a labor of love for the great pioneers which have left us too soon! We have had the honor of actually performing background vocals for many of these individuals. This CD is dedicated to them and to the quest of keeping the legacy alive! Pick it up at your oldies record shop today!!! We'd also like to take this opportunity to inform you of another great Shep CD we recorded a few years ago and are still very proud of. 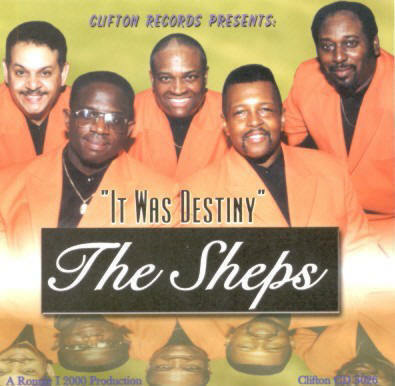 The "It Was Destiny" was introduced to the public in Jan. 2002 and sold like wildfire. We could tell by the sales that we are doing something right! If you liked this one you will love the new one. For you unfortunate DOOWOP lovers and collectors that haven't heard or purchased either CDs...SHAME SHAME SHAME! You can still purchase it at all the oldies record shops or at our public appearances. ...THEN WE HAVE THE FIRST ONE!!! 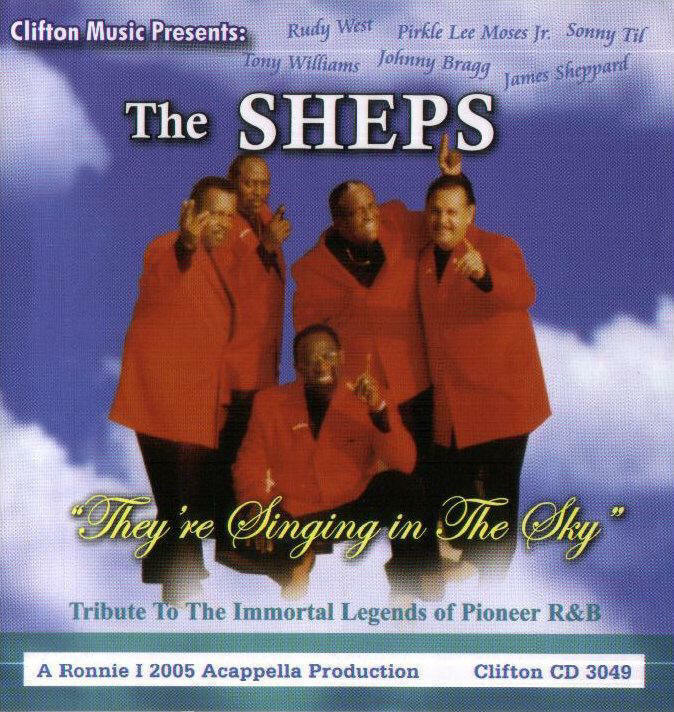 Released in 1994 by the original Sheps! If you are lucky enough to have this one in your collection, hold on to it! Our very first CD is sure to become a very valuable commodity in the future! 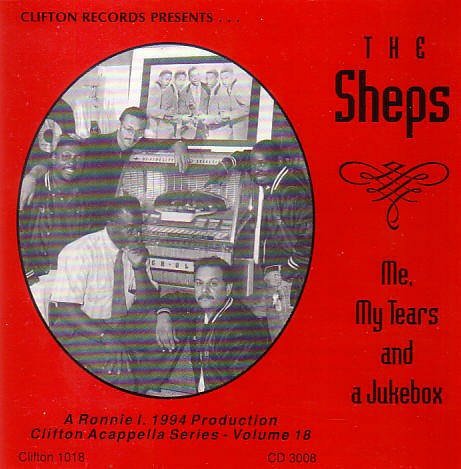 "Me, My Tears And A Jukebox"...a Tribute To The Authentic Roots Of The 1950's is and excellent display of classic R&B. This tribute to the unsung pioneers of yesteryear is a must for the serious collector. There are still copies out there for sale so if you are lucky enough to see one, purchase it! You will not be sorry! The Sheps Website is dedicated to the memory of all the pioneers that we have paid tribute to in the past, the present and will continue in the future. Please browse through and get to know about us! NEWS OF OUR NEXT PUBLIC APPEARANCE SOON!!! Click here to join our mailing list, fan club membership & for engagement contacts!